I woke up on Sunday with a hankering for something fragrant, spicy and defiantly Thai. Not Chinese, not Japanese, Italian or Turkish. Not even Vietnamese. It had to be Thai. There’s something so comforting and yet explosive about the delicately balanced flavours and textures you get in a Thai meal. The heat, the sweetness and wonderful, dark, deep pungency. I love it. Until I was 21 and found myself in Australia, Thai was a completely unknown cuisine to me. And then there we were, standing on a Sydney street, jetlagged and exhausted, wondering what to do and where to eat. Opposite, a Thai restaurant, gleaming in the dusk. The food was fantastic and my eyes were opened to a whole new cuisine. It was unlike anything I had yet experienced. There was something of the freshness of Italian, the heat of Mexican, the textures of Chinese but utterly different from all three. The lemongrass, the birds eye chilli, the dried shrimps, the rice noodles were all brand new. It wasn’t until we spent 6 weeks in Thailand however, that I really realised the sophistication, variation and sheer breadth of Thai cuisine. From the salty mussel omelettes and coconut curries in Bangkok, the salty-sweet BBQ Isarn dishes of the north east, the searing salads we had in the north and the red hot dried fish curries and beef of the muslim south, it was a life changing experience. My tastebuds travelled further than my feet. Street food, posh restaurants, home cooking, we tried the lot. Ever since then, Thai has been consistently in my top five cuisines. Happily we live in London where there enough places that sell the right ingredients. Astringent galangal, fragrant lime leaves, egg aubergines, and so on can all be found in the Oriental supermarkets in China town or on Mare Street, East London. To go with the curry I made the prawn cakes I blogged about last month, stir-fried some fresh greens with garlic, ginger and Soy sauce, and steamed some basmati rice. This is one of my favourite Thai curries – fruity and not too spicy, it’s a gentle, salty-sweet and nutty curry that really complements the strong flavour of the beef without the whole thing becoming too rich. If I were to make it again I would add one or two more birds eye chillies for a bit more oomph. However, if you like your curries fragrant, soothing and tasty – this is just right. You can use pretty much any cut of beef here. I happen to have grabbed some ribeye in the butcher which is why it’s in the ingredients. But I’ve had great success with rump (it was The Ginger Pig’s 90-day aged rump mind you), and brisket, hanger, shin would all work well. You just need to adjust the simmer time to match the cut. The tougher the cut, the longer you simmer it (and the better flavour you get). This definitely isn’t something for a fillet steak, it would get totally lost in the parade of strong flavours. Start off by making the paste. Combine all the ingredients in a blender and blend to a paste – mine came out the consistency of a good hummus. Cover and put to one side. Pour the coconut milk into a pan and bring to simmer. Slice the steak into large bite sized pieces, removing the fat, and add to the bubbling white liquid. Turn the heat down to low, cover and leave to simmer for at about an hour and a half. Remove from the heat and leave to cool down. Heat a tablespoon of oil (ground nut or rapeseed is good) over a high heat and add four tablespoons of the curry paste. Put the rest aside for another day, it freezes for a few weeks quite well. Stir and fry for a couple of minutes and then add the birds eye chilli and stir and fry for another couple of minutes. Quarter the aubergines and chuck them in stirring as you go. Continue cooking for about 3 or 4 minutes. Add the beefy coconut milk slowly stirring as you go. Drop in the beef, splash in the fish sauce and add the sugar and lime leaves. Turn the heat down and leave to bubble gently for about 20-30 minutes until everything else is ready. this is SPLENDID. peanuts, dried chilies, beef, lime leaves, thai aubergines, oh my, just gorgeous. hope you had a nice beer to go with. i like how you post your own recipes. wow – you used rib eye to simmer for that long? I’ve not tried cooking that cut for so long. I’ve had a hankering for Thai food recently too – it must be all this dreary weather. oh Thai is one of my favourite cuisines also! We constantly hit up Siam Central on Charlotte St for good thai… but I rarely (in fact never cos I can’t get it right!) cook it at home. Your curry looks unbelievable. @Lizzie – i did, I was a bit worried I’d kill it (or at least make it not as good as fast grilling it for a minute a side), but it tasted great. I guess if it’s good meat, it’ll taste good whatever. Although i would hesitate to use sirloin or fillet. I reckon rump’s the best combo of tenderness and taste. And you’re right regarding Thai food in winter – it’s wonderful. @shayma – Thanks! it did taste rather good (even if i say so myself). I’m only now getting to the stage that i will start to improvise and play around a little with the ingredients and recipes. I didn’t have beer this time (although it would have gone very well with a pale ale), i did have a glass of sake and a shot of Yamazaki 12yo whisky…mmm….very warming. I am very impressed that you even made your own curry paste! What do you think of shop bought varieties (the Thai Mae ploy for instance)? I have to admit I normally use this brand, I think it is quite good. It was fun meeting you at Gunmakers yesterday, it was a shame we never got to chat properly, but hopefully I will see you again at the beginning of March! Thanks LF! I cheat by blending rather than pounding so my pastes may be a little more granular than they should. It;s a whole lot easier and isn’t much more difficult than making Garam Marsala. I usually find that the shop prepared ones can be too salty (much like stock) for my taste, but Yhai Mae Ploy isn’t bad. It was a fun (if fleeting) meeting. I will do all i can to make the beginning of March so we can have a proper chat. And i’d really like to hear about your trip. I would like to invite myself and Simon over to your house for dinner! This blog of yours drives me incredibly hungry!! Looks amazing! Also – maybe you should guest chef at one of our nights. Guest chef? Wow! Not sure how I would cope – the most I’ve ever cooked for is 10 – and that was just the once. 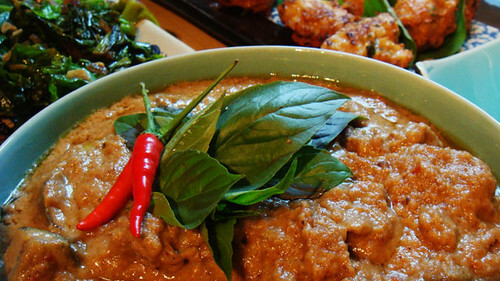 Have you ever tried Malaysian Beef Rendang? @Comestiblog – i haven’t – i have tried scandalously little Malaysian food – a little Nyonya and Malaysian-Indian (some of the best curry i ever tasted was in Penang, Northern Malaysia). I know this is a southern Thai thing, so it may well be from the same root (or indeed be exactly the same thing!). Well I am going to have to ask how well the beef took on the flavour of the curry. I have had a couple of gos at making a beef rendang recently (Rick Stein’s recipe) and each time the beef has remained rather neutral and beefy in flavour. It took it quite well – all the flavours combined nicely. I haven’t read the Rick Stein recipe so i can’t really comment on particulars. However, what I did notice is that the long simmering in the coconut milk (and leaving to cool down and infuse a bit) added both a coconutty edge to the beef and a really beefy flavour to the coconut. Some recipes call for fresh coconut milk for the latter stages, but i used the beefy stuff from the long simmer. Then, I left the end result to simmer for another 30 minutes or so which isn’t in any of the recipes I have looked at. I think that also helped all the flavours combine. I wonder if the long simmer softened the meat enough so that it absorbed the flavour of the paste? What cut of beef did you use? Just some stewing beef (not actually sure of the cut – but cheap). I stewed it for over 3 hours slowly and even left it overnight… Maybe the way to go is to get a good cut of beef as the flavours will infuse more. @Tom it could well have been the cut – i have had similar issues with stews and beef – different cuts yielding very different results. Maybe try it out with some decently aged rump?